16 Nov 2018 --- The journey toward fermentation versus farmed animals has taken a step as disruptive start-up Perfect Day teams up with agricultural processor and ingredient giant Archer Daniels Midland Co. (ADM) to develop and commercialize animal-free dairy proteins. The joint development agreement will lead to supplying the world’s first animal-free dairy proteins to the food industry in 2019, in what is arguably a milestone in the reinvention of dairy. As a company specializing in the production of environmentally friendly and nutritious sources of protein, without the use of animals, Perfect Day received its first patent for the use of animal-free dairy proteins in food applications in February. It has been making waves in the animal-free dairy space for a while, but the new joint agreement with ADM marks significant progress toward developing and commercializing animal-free dairy proteins. Now, the plant-powered start-up will work with ADM to optimize and scale up the production of dairy proteins using fermentation in microflora. These animal-free dairy proteins will be the first in the world to be produced at a large scale via fermentation instead of using farmed animals, which have historically been the only way to produce dairy proteins. 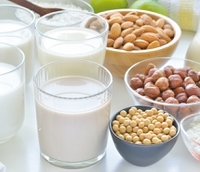 Animal-free dairy proteins will not only offer consumers a lactose-free, animal-free alternative to conventional animal-based dairy but also provide a portfolio of nutritious and functional, high-purity proteins with similar taste and nutrition profile of dairy proteins for a wide range of food and beverage applications, the companies report. Ryan Pandya, Co-Founder and CEO of Perfect Day, echoes these thoughts. “We are on a journey to bring sustainable, nutritious and delicious dairy to everyone. We are thrilled to partner with ADM, a global leader in fermentation, to accelerate our path to market. With this partnership, we will enable brands to make your favorite foods in a kinder, greener way,” he says. Perfect Day employs fermentation to make animal proteins, in this case, whey and casein commonly found in milk. In an article published in the September issue of The World of Food Ingredients, Colton Biehl, Fermentation Specialist at The Cellular Agriculture Society briefly detailed the technology behind Perfect Day through the highlights of a discussion with Ryan Pandya, Co-Founder and CEO of Perfect Day. Pandya explained the difference between the way fermentation is employed to make, for example, beer and the way it is used to produce dairy milk. “To make beer you take barley and hops, you add yeast to it and then filter out that yeast. In Ryan’s milk-producing plant, however, his yeast cells create a product in a medium. The product is just the milk proteins, which are casein and whey. These proteins are then separated and purified, not the yeast cells themselves. Pandya also clarified that the fermentation technology employed by his company and other industrial fermentation companies is a highly aerobic process, meaning that the cells require a lot of oxygen. This is drastically different than, for example, lactic acid production that occurs in muscle cells when oxygen is absent (anaerobic conditions),” he explained. Pandya made it clear that his vision for the company is not entirely “milk-centric,” but rather a longing to reinvent the way in which dairy products are produced. This vision seems to be focused on the long-term positive impacts that such a transition would have for animal welfare, our environment and human health. According to Tim Geistlinger, CTO of Perfect Day, a massive variety of products, not only milk, will be coming out of Perfect Day’s plant sooner than we think. Perfect Day’s growing success is partly down to a huge shift in consumer awareness as growing numbers of people think more about their food than ever before. There is a change in consumer purchasing decisions toward food products that have sustainability and ethical credentials as well as being perceived to be good for the environment. Animal welfare is also high on the agenda. Perfect Day is tapping into this paradigm shift and the joint agreement with ADM represents a significant milestone in the reinvention of dairy. Perfect Day’s first project with ADM is an animal-free whey protein that can be used in a wide variety of food products, across many different categories and geographies. Through this partnership the start-up will leverage ADM’s existing fermentation infrastructure to bring the cost of producing animal-free whey protein down to that of conventional whey protein, allowing the company to bring its new source of nutritious protein to full commercial scale within the next few years.